If the dry bag is used properly, the dry bag will keep all gear perfectly dry. 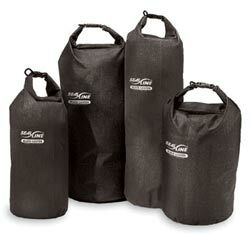 There are numerous types of dry bags. Purge Valve Bag: This type of dry bag will allow for the bag to be burped and let the excess air out of the bag. This is a very valuable feature as the precious space is not being taken up with air. Clear Dry Bag: The clear dry bag is extremely beneficial as it allows you to look inside the dry bag without having to unload each dry bag trying to find something that you need. Compression Dry Bag: The compression dry bag lets you compact your sleeping bag to take up a minimum amount of space and at the same time keeping it dry. 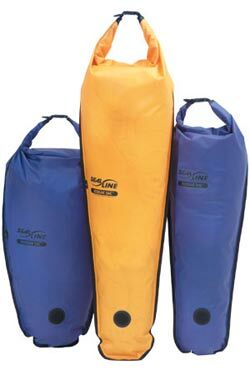 Deck Dry Bag: The advantage of this dry bag is that it attaches to the kayak deck allowing you to access gear that you need to be readily available, but not getting wet. Duffel Dry Bag: This dry bag is easily carried with the top strap handle or carried with a shoulder strap and at the same time keeping the gear dry. Tapered Dry Bag: This dry bag is used for packing gear in the front of the bow or in the back of the stern bulkheads. The bag is tapered to fit exactly into the smallest parts of the boat to maximize the amount of gear that can be stored. Dry boxes are very sturdy and safe. They will protect gear from impact better than dry bags and they come in all different shapes and sizes to fit all your needs. Some dry boxes even include dry cell foam which allows you to custom design a shape for protection. I used a dry box for my camera and lens and I cut the actual outline of the camera and lens into the foam. The camera fits perfectly into the foam and nothing can damage the camera and the camera remains perfectly dry. Some dry boxes even have a valve to let out the air from the box. The dry boxes can hold a GPS, cell phone, eyeglasses, etc. and the boxes float. Pouches hold maps, cell phones, GPS, VHF radio, eyeglasses or anything else that is small and needs protection from the water. The pouches are designed to float... but I would make sure first before I lost something valuable when it sunk in the water. Choose the right combination kayak storage bags or boxes and you won't have a disappointing paddle.